Defence researcher Phil Jackson (left) and colleague Bradyn Gray retrieve a TAPS tow-body during a trial in South Australia's Spencer Gulf. Defence Science and Technology (DST) Group has acquired new technology to aide its research into underwater acoustics. The research group has a new Towed Acoustic Projector System (TAPS), which it said will "significantly improve how the organisation conducts its underwater acoustic research". DST Group said it has been using it’s much larger 10-tonne sonar research projector system (SRP) for many years to conduct experiments that require the transmission of sound waves underwater. DST Group researcher Phil Jackson said the new TAPS is not only cheaper than the SRP, but also easier to use. 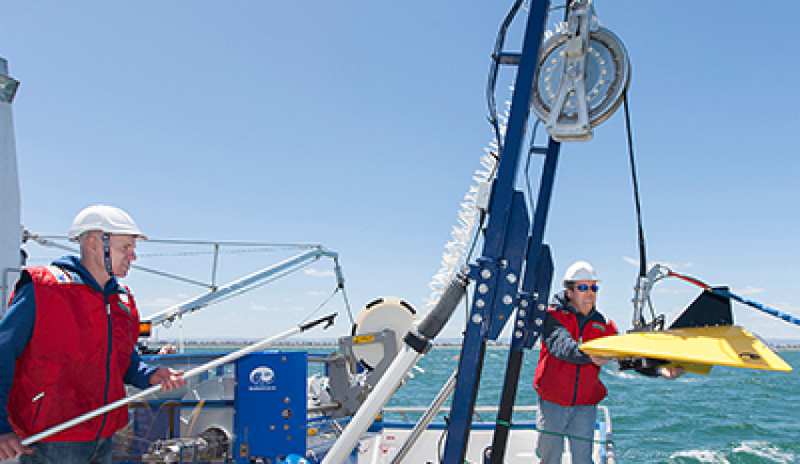 "Being so much smaller and lighter we can fit TAPS on a variety of smaller vessels, increasing our flexibility when it comes to trials requiring an underwater acoustic source," Jackson said. "At less than 900 kilograms, the new TAPS winch, launch and recovery system, and associated equipment, can be easily moved with a forklift, transported in a standard trailer and rapidly installed on a vessel." The TAPS was the result of a RFT that Canadian sub-sea detection specialists GeoSpectrum Technologies won. Jackson said he received advice and assistance from his Canadian defence science counterparts from Defence Research and Development Canada, which helped complete the procurement process smoothly and on time. Jackson has already begun training other DST staff to set up and use TAPS. "I think this will really assist with our research program. It is much easier, faster and cheaper to get TAPS into the water for research, so we’re excited about the opportunities to use it on trials in the future," he said. Both the TAPS and SRP systems require the acoustic transducers to be towed by a cable through the water as they transmit acoustic signals representative of different maritime objects such as submarines, torpedoes and boats. While the SRP tow body incorporates the entire frequency range (50 Hz to 10 kHz) in its single 640-kilogram unit, TAPS has five interchangeable 20-kilogram fibreglass “V-wing” tow-bodies, each fitted with an acoustic transducer that covers a smaller frequency range. "We found in practice that very rarely do we need the entire frequency range at once, normally just a subset," said Jackson. "So we made the design compromise of having to swap tow-bodies for a lighter system that is logistically much easier to manage. "It only takes 15 minutes to reel a tow-body in and swap it; not an onerous requirement."